This classic tale makes the perfect gift for little boys who love adventure! A little boy has a toy boat that he made out of a can, a cork, a yellow pencil, and some white cloth. The boy and his boat are inseparable . . . until the day the wind pushes the boat out into the wide lake, and the little boat must face fierce waves, a grumpy ferry, a sassy schooner, and a growling speed boat if he is to find his way home. From Randall de Seve and bestselling artist Loren Long, creator of the Otis series and illustrator of The Little Engine That Could, comes a child-friendly adventure sure to inspire imaginative toy play. 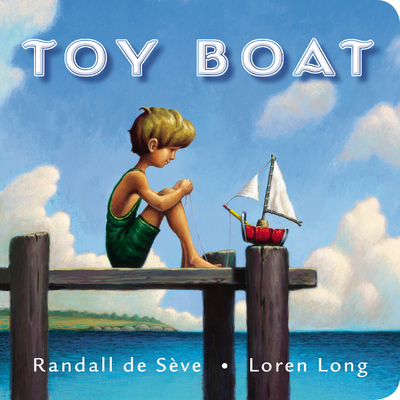 Randall de Sève made her debut as an author with the New York Times bestseller Toy Boat, illustrated by Loren Long. She is also the author of The Duchess of Whimsy, illustrated by her husband, Peter de Sève. Randall lives with Peter and their two daughters in Brooklyn, New York. Loren Long has puff puttedy chuffed his way all over the bestseller lists with such titles as Otis, Otis and the Tornado, Otis and the Puppy, Drummer Boy, The Little Engine that Could by Watty Piper, Toy Boat by Randall de Seve, Mr. Peabody's Apples by Madonna, and Of Thee I Sing by President Barack Obama. Loren lives in a suburb of Cincinnati with his wife and their two sons, all frequent visitors to his studio, where they see the art and hear the stories first.